Sewing can be an incredibly useful skill to learn for your kids. However, whether it turns out to be exciting and interesting or boring and challenging for them may very well come down to the sewing machine you get them for learning this skill. And this is the reason it is important to choose the sewing machine wisely if you want your kids to seriously learn some great sewing skills and make cool stuff on their own. But we also understand that it isn’t an easy choice to make, even for some of the most experienced sewers out there. And that’s where this useful resource comes in, as it walks you through the best sewing machines for kids on the market that offer pretty much everything your kids need to learn sewing while being affordable and easy to use. The Runway CS5055PRW is absolutely the best sewing machine for kids. And that’s simply because it’s just as functional as it is easy to use, which is the perfect balance you would want if you want your kids to seriously learn sewing and not just have some fun. The problem with many products that are often termed as the best kids sewing machines is that while they are very easy to get used to, they have little to show in terms of their “sewing” functionality. This makes them a good product for your kids to have some fun, but they definitely don’t help them much as far as learning the skill of sewing is concerned. But the CS5055PRW totally stands out here. 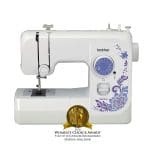 It’s very functional with 50 built-in stitches, a free arm for working on some more demanding sewing tasks, professional quality buttonholes and fairly easy threading. Further, it would also allow your kids to unleash their sewing creativity with irs designer and finishing solutions, which mean they would also be able to work on things that are beyond the basic sewing tasks. It’s also a complete sewing package, as it comes with 6 specialty feet, specialty needles, different stitches and more. However, one of the best things it includes for free is a very helpful book that contains all the information your kids will need to get started with it. Users have been mentioning how easy the machine is to use, especially with the sewing help they get from the book, despite never having sewed anything ever before in their life. This is precisely what makes it a perfect kids sewing machine. The different starter needles it comes with would help your kids get started with the machine right away, and you wouldn’t have to spend a single penny on additional accessories like a hand sewing needle until your kids have become more experienced sewers and you would like them to take on more demanding sewing projects. The reason we think it’s clearly the best kid sewing machine is that it offers a great balance of functionality and ease of use. While there are many other sewing machines that can be even easier to use than the CS5055PRW, but you definitely won’t get the kind of functionality you get with this product. So if you’re looking to help your kids learn sewing, the other easy-to-use machines won’t turn out to be a very good option, but the CS5055PRW definitely will. The book and additional accessories it comes with will make it very easy and fun to introduce sewing to your kids, and they will be able to get started with it right away. 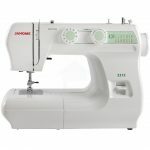 If you’re after a more beginner-friendly sewing machine for kids without compromising much on the functionality, then the Janome 2212 will be right up your alley. Customers that bought it talk about how it turns out to be a great product for total beginners, as it helps them learn well without getting confused, and is a durable machine that will certainly stand the test of time. 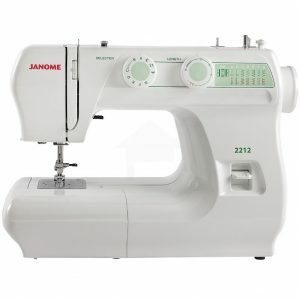 The Janome 2212 is a mechanical sewing machine that’s not only very beginner-friendly, but also has some serious power. It can sew and quilt through multiple layers of sewing fabric, which is quite impressive for one of the most kid friendly sewing machines. A customer mentioned how they used this machine to sew through as many as 10 layers of heavyweight fabric, and it still had no problem working just as well. 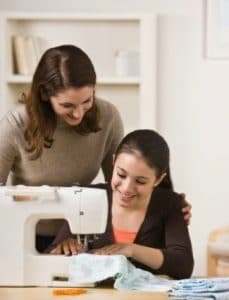 This means that if your kids do decide to work on some of the more serious sewing tasks, they will easily be able to do so without you having to purchase another more heavy-duty sewing machine. But it’s still the best sewing machine for children when it comes to the overall ease of use. There have been customers of this particular machine as well saying how they never sewed anything before in their life, but were able to make amazing things right from the first day of getting this great childs sewing machine. Finally, it’s also versatile enough to handle pretty much all types of fabrics, be it the simple cotton or the much more demanding vinyl, or even a brocade fabric and a barkcloth fabric for that matter. We like how powerful of a sewing machine it is by a child sewing machine’s standards. It can work on a huge variety of projects, so your kids would probably never run out of things to do with this machine. Being a mechanical sewing machine, it’s also much more durable than a computerized sewing machine, which often breaks down much faster than the former. And that’s without being any more difficult to use than the other kids sewing machines. So again, if you want your kids to be able to work on some “real” sewing projects, then the Janome 2212 may very well turn out to be your best bet. As the name suggests, this is one of the best sewing machine for kids by Singer. Despite one of the more powerful and reliable sewing machine for kids, it’s just as easy to use as the ones we reviewed above. Sure, it can be slightly more difficult to set up initially – especially if you have never used a sewing machine before – but once you do, you would be able to get working on it in no time. Being a Singer machine, it can sew through heavy duty fabrics like a breeze. The step by step instructions and diagrams make it incredibly easy for your kids to start working on real sewing projects right from the first day of getting this machine. It comes with a free arm for extra versatility, 6 built-in stitches that take a lot of challenge out of the common sewing tasks, and a built-in 4-step buttonhole that makes things a lot easier for your kids. The Start 1304 is also surprisingly lightweight and portable for a fairly heavy-duty sewing machine, which would turn out to be very useful if your kids have been going for sewing classes. One of the most unique features the Start 1304 offers is automatic bobbin winding. You just have to follow the instructions printed on the machine, and winding the bobbin – which usually turns out to be one of the most challenging sewing tasks – would become super easy as the machine itself will wind the bobbin for you. This is something that also makes a very safe sewing machine for children, as winding the bobbin is something that can end up getting your kid’s fingers hurt if they mess things up when doing it. The level of sewing “automation” that the Start 1304 brings to the table is something we like the most about it. It takes care of one of the most challenging and trickiest sewing tasks on its own, which is winding the bobbin. It also has different pre-set stitch width and lengths, so your kids would just need to select the ones they need to use, which would make things a whole lot easier. And it offers all this while letting them work on big and complicated projects as well, as the Start 1304 is powerful enough to sew through heavy fabrics or multiple layers of fabrics at once. The Brother XM1010 is another one of the most portable sewing machines for children on the market. However, unlike some of the others of its kind, it’s a full-size sewing machine and comes with pretty much all the features your kids may ever need to work on different types of sewing projects. You would also have 10 built-in stitches that would include zigzag stitch, blind hem, four-size buttonhole and different stretch stitches. These stitch options cover a lot of projects, and your kids likely would be able to work on pretty much everything they want using these stitches. There’s also an easy stitch selector dial that takes this feature to a whole new level, allowing kids to easily choose from different types of stitches, including decorative and utility stitches. 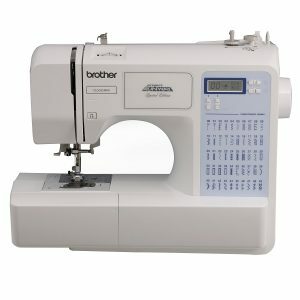 And just like the Singer child’s sewing machine we reviewed above, the Brother XM1010 comes with an automatic bobbin winder too. However, along with that, you would also have a drop-in top bobbin and other features that add greatly to the overall functionality. This is a LOT of free stuff for a machine that’s priced well under $100. It’s easy to see how you’re getting a great value here. That all said, the extra value does come with a downside. 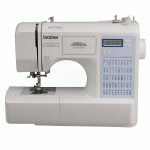 The Brother XM1010 is not as easy to work with as the other beginner sewing machine for kids that we reviewed above. There are things like a short cord, stripped-down bobbin winder, no integrated needle threader and more, that make it considerably more challenging to work with. The lack of a needle threader in particular is very challenging, as it can make the usual threading a bit inconvenient for kids. However, if you’re fine with your kids taking longer to get used to it before being able to use it properly, then it can still turn out to be a great children’s sewing machine all the same. It simply offers a great value for a kid sewing machine priced under $100. You get a lot of useful accessories for free, and the availability of decorative and utility stitches make it very versatile. There are also some great features that are otherwise hard to come by at this price point, such as an automatic bobbin winder. First things first: As you can tell from the child sewing machine reviews this machine has received, it definitely isn’t one of the best sewing machines for girls or kids on a general level. That said, however, if you’re after one of the cheapest sewing machine for little girls, that offers limited functionality and is not as durable, then it may still turn out to be a good sewing machine for kids. The features are certainly more than good enough for the price. However, as we said above, the functionality you’re offered is fairly limited. It sews on lightweight cotton fabrics well, but don’t expect it to work on anything much heavier than that. It can also sew on something like denim though if you’re careful, but you would probably risk encountering durability issues if you do it too often. That said, however, the threading is very easy, and kids as small as 6 years would be able to do it well with your guidance. It comes with a pedal, and if you’re working on some serious sewing projects, you may have to use the pedal as it can be difficult to work on such projects without the pedal. The machine is also very small and lightweight, and while that’s good for portability, it also translates to a much lower level of durability compared to the other kids sewing machines we reviewed above. The price is obviously the best thing about it. You get a fairly functional kids beginners sewing machine for pretty much the price of a slightly expensive toy. It does work well when you use it on lightweight fabrics, or even on something like denim occasionally. But don’t expect it to serve you well if you throw much heavier fabrics at it. 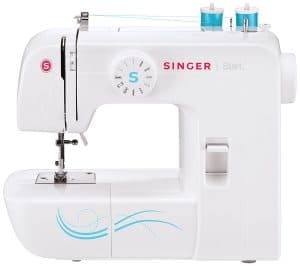 It’s also lightweight and portable, and threading the machine is very easy, making it a good choice for small kids or little girls that won’t be working on real sewing projects anyway. How We Choose the Top Sewing Machine for Kids? If you have browsed around our blog a bit, you know we have shared a lot of detailed, helpful information about choosing sewing products. 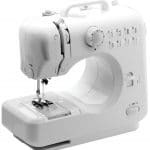 This ranges from choosing different types of sewing machines like a chainstitch sewing machine to different sewing essentials. And as you can tell from each of the post you find, all our information is backed by solid research. Our approach for choosing the top sewing machine for kids is the same. Some of the most important factors we consider is the ease of use, which is very obvious, as you may be using sewing to your kids for the first time. Similarly, we also make sure that the ease of use doesn’t come with a huge compromise on the functionality, as the machine also needs to be fairly functional in order to serve the purpose you have bought it for. This is regardless of whether you choose an electronic sewing machine or an overlocker sewing machine, as these two factors would remain the same for them. We also consider the size of the sewing machine; after all, not everyone may be able to dedicate a sewing room to teach sewing to their kids. This means that we prefer machines for kids that are more portable than some of the heavier ones like a chainstitch sewing machine. 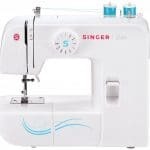 Finally, we also try to pick machines that are fairly affordable compared to the ones we recommend for adult sewers, as naturally, parents may not want to spend hefty amounts on teaching sewing to their kids when just starting out. After all, they may also have other expenses to cover as their kids make progress, such as getting quilting cutting mats and quilting rulers and ruler racks as their kids decide to get into quilting as well. There aren’t exactly different types of sewing machine for kids in the sense that they are very different from each other or are designed to serve a very different purpose, but they are definitely certain types of sewing machines that are not believed to be an ideal option when teaching sewing to kids. 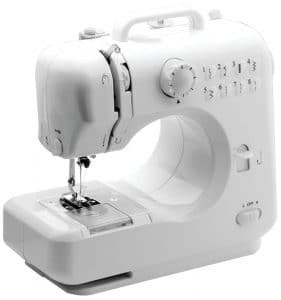 This specifically includes a coverstitch sewing machine and perhaps even a lockstitch sewing machine, as these can be fairly difficult to get used to compared to a mechanical or computerized sewing machine. Similarly, as your kids won’t get into quilting right when trying to learn sewing, going for a sewing machine for quilting doesn’t make much sense either. Needless to say, you also wouldn’t want to get a load of quilting supplies just yet, as you don’t know whether your kids will find sewing interesting or want to quit before they can learn much. However, there can be differentiations with respect to the brand of the sewing machine. A Brother sewing machine is likely to turn out to be a better option for kids than other brands, as it may be easier to get used to and offer just the right features to help your kids learn sewing faster. This is one of the reasons we have chosen a Brother machine as our best sewing machine for kids. That said, something like a Janome sewing machine may also turn out to be a fairly good option, given you’re sure about your kids being able to handle a little complicated sewing setup. The same goes for a Singer sewing machine, but you will need to be careful what you choose. If you go with the Start 1304 we have reviewed above, then it may work just as fine. Finally, a Juki sewing machine is something you may want to avoid, as it can be a bit too overwhelming for kids, even if they are determined to learn sewing. Why You Need to Get the Best Sewing Machine for Your Kids? Learning sewing isn’t exactly as easy as it might seem, especially for kids. Sure, getting a cool sewing chair and a functional sewing desk may attract them to give it a try, but it turns out to be too challenging for them, they will likely give up on it before they can go far. The best sewing machine for kids that we have found and reviewed above ensures that it takes a lot of challenge out of the otherwise complicated learning process. This makes it easier for kids to learn sewing and get familiar with all the sewing basics. Once they get the hang of things, they will then easily be able to move on to some of the other more complicated sewing tasks. This is the reason the best sewing machine we have recommended for kids is both easy to use and functional, so that it allows the kids to keep getting better at sewing and make a lot of new stuff and learn new skills once they have got well-versed with the basics.